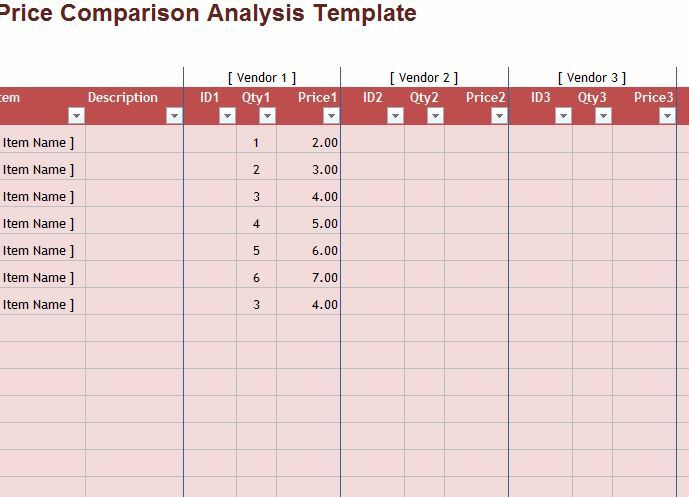 If you’re a store or business owner and you want to compare the prices of different vendors, then this template is the perfect tool for you. Not only does this template do all the calculations for you, but you will also be able to store this information for as long as you want and reuse the document over and over again. By simply analyzing the prices of different products and vendors, you can easily make the best business decisions for you company at a minute’s notice. To learn more about this convenient tool, just read the information provided below. You will need to enter the list of items that you want to analyze in this document in the “IDs & Vendors” tab. Simply go through and enter the required information for each item in a new row of the main table. You will start by listing the item, description, ID (your store’s system), etc. When you have that information listed, you can start entering the information for possible vendors to supply you with their products and ultimately determine which the best deal for you. The Price Comparison Sheet will take all the data you listed here and give you exact calculations for each product/vendor at the bottom of the page. You will then compare these figures to decide the best option, which includes shipping costs. Finally, go to the “Prices” tab and enter the current items you have in stock. You can use the navigational arrows to select the possible vendor options you listed on the other page and compare them one-by-one or all at once, it’s completely up to you. To make the best decision for your business, the Price Comparison Sheet provides you with all the data and does the necessary calculations, saving you time and money in the process.